US, 1953, 105 minutes, Colour. Charlton Heston, Jack Palance, Katy Jurado, Brian Keith. 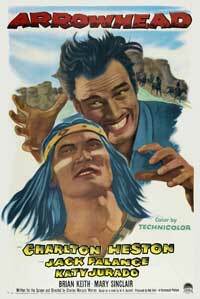 Arrowhead is an early film for Charlton Heston. Having emerged with strength on the screen in 1950 and appearing in The Greatest Show on Earth in 1952, he made a number of smaller-budget films for Paramount Studios as well as being loaned out for bigger-budget films to 20th Century-Fox? (Ruby Gentry with Jennifer Jones) and making Lucy Gallant at Paramount with Jane Wyman. This film reflects the difficulties in presenting the conflicts between whites and Indians which had emerged in the late 1940s and early 1950s with such films as The Devil’s Doorway and Broken Arrow. Heston portrays a chief of scouts who avoids an Apache ambush while working at Fort Clark in Texas. The context is the discussions between the army and the Apaches and the issue of moving the Apaches to Florida reservations. The Apache chief’s son has gone to study in the eastern universities and clashes on his return with the scout. There is a final confrontation – which makes the issues of white versus Indian as well as questions of the future very difficult. Heston is his usual self as the scout. Katy Jurado appears as a spy who lives with the scout. Jack Palance is a blend of the sinister and the smooth with his performance as the chief’s son. The film was directed by Charles Marquis Warren, director of any number of interesting but routine westerns. His final film in 1969 was a western with Elvis Presley, Charro! 1. A convincing and enjoyable western? The use of western conventions? The authentic atmosphere of the characters and places? 2. The film as a Charlton Heston vehicle of the fifties? Particular characteristics, style and appeal? 3. Audience response to the basic plot and structure: white and Indian hostility, assertion by Indians, Indians stalking whites and vice versa, the culminating fight? 4. What were the film's attitudes towards the Indians? The attitudes of the fifties, of later decades? Sympathetic treatment, understanding, hostility? 5. The picture of white-red relationships? The initial sequences, the Apaches and the threat to their independence, their dreams of conquering the whites? The army and its attitudes? Ed Bannon and his suspicions? 6. The film's focus on Ed Bannon as a western man of the 19th century? What American attitudes did he typify? His antipathy towards the Indians, his understanding of them, his background in growing up with them and thinking like them? His correct estimates of situations? His harsh attitudes and their justification? An interesting and authentic character or not? 7. The Indian and his education? His entry from the east, education, hopes, fulfilling Indian dreams, leading the Indians to victory? A suitable dramatic balance to Bannon? 8. The sequences of killing, the skirmishes? 9. Comment on the pacifying attitudes of the army? The army characters, their relationship to Bannon, distrust of him, use of him? 10. The dramatic build-up to the final confrontation and siege? The sniping in the night? The importance of the final confrontation and the Indian's death? The ending of a myth? 11. Now much insight into the American heritage and Indian-white relationships?